Bafetimbi Gomis has scored three goals in 12 appearances for France. 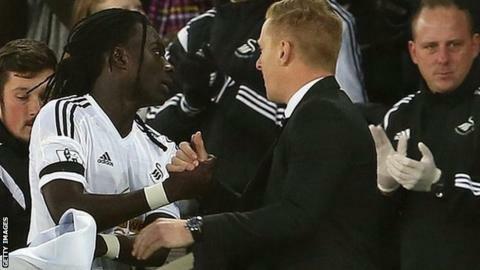 Swansea manager Garry Monk says Bafetimbi Gomis has a chance to "make a name for himself" at the club. Monk has spoken to the 29-year-old Frenchman about his comments on French television that raised doubts about the striker's future at the club. Monk said the conversation "remains between us", but predicted a bright future for Gomis. "I think this is an important period for us as a club, it's an important period for him as a player," he said. The 29-year-old had limited starting opportunities with Wilfried Bony preferred up front. But the Ivorian's transfer to Manchester City in January, 2015 in a deal worth up to £28m has opened the door for the former St Etienne and Lyon player. Swansea City manager Garry Monk says Bafetimbi Gomis can make a name for himself at Swansea after Wilfried Bony's transfer. Gomis has started in the last four games, scoring twice and rescuing a point against West Ham with a header that Mark Noble could only put into his own net. But his comments on the Canal Football Club programme on Canal Plus suggested he was looking for a move away from Swansea. He also claimed he had been promised more starts while top-scorer Bony was still at the club. Monk says he understands Gomis' frustration, but that he now has a chance to prove himself on the pitch. "We're trying to progress and this is a period now where he has the shirt," said Monk. "It's his for the losing and strikers that have come in and done well for Swansea City have created a lot of interest and some have gone on to bigger and better things. "He's in a perfect position to go on and make a name for himself at the club. "That's what I'm hoping Bafe will do. I know that's what he wants to do, and hopefully that's the case for the rest of the season." Swansea face Blackburn in the fourth round of the FA Cup on Saturday, with Gomis likely to start up front. The Swans have also been boosted by the return of left winger Jefferson Montero from a hamstring injury, and midfielder Jonjo Shelvey is also available after suspension.